Forklifts dominate OSHA’s annual list of safety violations, so it’s no mystery why industrial companies are always searching for ways to improve safety. Safety-conscious operations are integrating safety lights and sensors to help reduce pedestrian/forklift accidents. These systems usually detect traffic (people and forklifts), and then deploy visual and/or audible warnings to the driver, the pedestrian, or both. When it comes to visual warnings, some are ceiling-hung, others at eye level, and others are shot onto the floor. What placement works best, and why? Cisco-Eagle has been in the safety business as long as we’ve been in business, but with the creation of our AisleCop and other safety specialization lines, we’ve worked with a broad range of clients to help them create intelligent traffic management plans enhanced by sensors, gates, mirrors, guardrails, and more. These concepts are combined with training to help make people safer near powered industrial trucks. Researchers believe that humans evolved to see threats on the ground, like snakes or other predators, and that we more easily see movement on the ground than we do at eye level or higher. “To avoid becoming snake food, early mammals had to develop ways to detect and avoid the reptiles before they could strike,” said University of California anthropologist Lynne Isbell, in a Live Science article. This evolutionary trait helps us see things at our feet better than we do in the air. It’s why warning systems that flash on the floor may be more effective. These lights aren’t sensors (they don’t detect anything) but work similarly to more sophisticated devices by providing a visual clue that a forklift is approaching. They’re particularly useful for forklifts in rack aisles, near work cells, and in trailer loading/unloading applications — anyplace where someone reasonably could not see the forklift before it emerges. These lights were a near-revelation when they first began to proliferate, and it’s easy to understand why: they were the first warning system that shot their warnings to the floor rather than at some other levels. Forklifts had sirens and strobes for decades, but they weren’t as good as the floor lights because they were on the lift itself, where visual clutter helped to reduce effectiveness, and because you had to be able to see the lift to see the light. The movement is another critical aspect of this success. The combination of movement on the ground makes the lights easier to see than if they were on the forklift, hanging on the wall or hanging off the ceiling. Adding intelligence and controls into the mix reinforces more sophisticated warning systems that use intelligence and controls to manage interactions between people and forklift traffic. Systems like AisleAlert, which uses motion sensors and PLC controls to flash warnings onto the floor when traffic is converging on a guarded location, take advantage of the floor as the most likely place for people to see a warning. There are other systems available that accomplish this, including sensor driven mirrors and those that utilize audio alerts. Does this mean hanging or rack-mounted sensors aren’t useful? Not at all – they have many applications, and are perfectly useful safety warning systems. When used in a “through-wall” application, for instance, a pair of warning devices mounted on either side of a doorway or dock door can inform parties on either side that there is traffic on the other. That would be difficult to do with a floor projection on each side of the door. 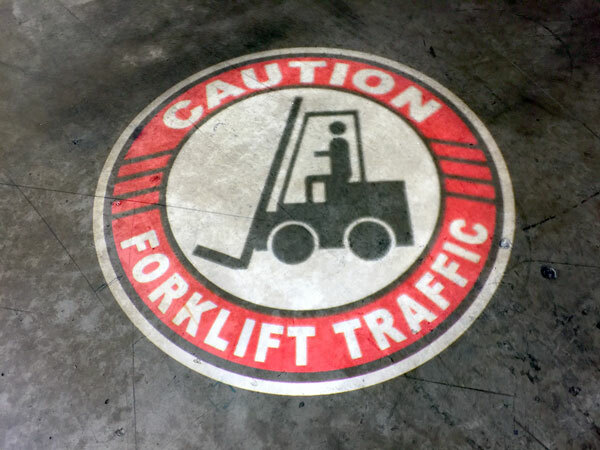 In many dock areas, the floor isn’t suited to floor projection, with forklift drivers backing out of blind-spot trailers and into staging areas. On some rack corners, visibility to a common intersection isn’t possible. Warning sensors mounted on a rack upright that blink both directions are very useful in those situations. Any situation where the floor is simply not conductive to visual warnings should consider ceiling-mounted, post-mounted, or eye-level warning systems. While movement on the floor is easier for the human eye to see, we are visually oriented and can easily discern warning lights at eye level or above our field of vision (particularly at range). It’s important to understand how these systems work, and where to best apply them as you work toward forklift safety in your facility.